Thanks for those who have commented upon our last few blog posts. These big lists–gift-giving suggestions for book-lovers of all sorts–were, as one friend noted, a labor of love. They are pretty time-consuming to research and write, but fun to do. There are literally stacks of titles by my desk of books that didn’t make it in my listings (not to mention the stacks in the shop.) If I had more time to write, I’d post even more. I’m sure if you had more time to read, you’d buy even more. I didn’t list anything for businesspeople on our recent lists. You most likely know that we have a large section on economics, books on globalization, God’s concern for the poor, and righteous ways to think about the sustainability and such. Serious thinkers about economics would surely find something here. And, we have many books on a Christian view of work. There are a lot of great titles on the ministry of laypeople in the work-world, the vocation of working in the marketplace, exploring the notions of callings and careers. Some are moving and inspiring, others short small group resources. We love stocking books on human labor and our work lives. Business is a happy combination of these, bringing together the worlds of economics and work. Business workers–from financial executives to those of us in sales, to all sorts of corporate jobs–labor in economics and surely need help thinking through the implications of being “salt and light” on the job site. It isn’t easy, as you most likely know; I’m sure it is so in every zone of life and in most careers, but the temptations and struggles of business these days are huge. And the opportunities of faithful service for the common good are also large. Here are a few newer books on business that we highly recommend. 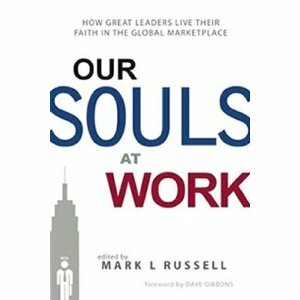 Our Souls at Work: How Great Leaders Live Their Faith in the Global Marketplace edited by Mark Russell (Russell Media) $19.95 This is a vibrant, colorful, book, handsomely designed with some contemporary, graphic pizazz and exciting testimonials and clear-headed insight to match. One of the best new books in this whole “marketplace ministry” field, it is essentially a gathering of short pieces by a variety of business leaders, arranged by topic. So you’ll hear a handful of businessmen or women talking about balance, or integrity, or leadership, or character. There is a section on calling, a section on handling money, a section of stories on relationships. There is one called “pluralism” which is very strong (and still a vexing matter to some, how to respect and honor the diversity of views in the modern workplace.) There is a section on sharing one’s faith, and a section of important lessons about ethics. The section on giving could inspire young philanthropists and remind us about giving back, as they say. There are a few business leaders here you may have heard of (David Miller wrote the important Oxford University Press book God at Work and has a good number of pieces and Dennis Bakke is legendary for his Joy at Work book and global success in the energy biz.) Most contributors, though, are not particularly famous in the religious book world. This should be seen as an asset, actually, because it shows these are folks who are the real deal, businesspeople who spend their days in the trenches of global capitalism. It gives it a very urgent, practical, feel, showing that transformed Christian living in the business world is not only interesting, but do-able. There are Fortune 500 CEOs and social entrepreneurs here and they share wonderful insights and personal experiences on living faithfully and leading others in the workplace. Russell Media did a great job on Our Souls at Work, and we are happy to promote it. It isn’t on a big-name publishing house so you may not see it at your airport book stall or your mega-church literature ministry. We have it, though, and are proud to suggest it as one of the best recent books of its kind. Plus, Our Souls at Work is easy to read and easy on the eyes so busy leaders can cut to the chase with tons of great advice—one of the great new books of its kind. Fantastic! 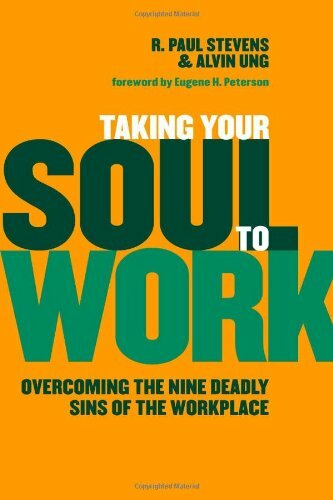 Taking Your Soul to Work: Overcoming the Nine Deadly Sins of the Workplace R. Paul Stevens & Alvin Ung with a forward by Eugene Peterson (Eerdmans) $14.99 If there was a “lifetime achievement award” in the field of Christian marketplace ministry, daily discipleship for ordinary folks, for “seven days a week faith” (as one of his many books puts it) Paul Stevens would be just such an honoree. He has given his life to thinking hard and writing well about the interface of faith and the work-world, and, especially, Christians in the business environment. He is professor emeritus of marketplace theology and spirituality at Regent College in Vancouver, perhaps the finest place to study this topic. (You can see a bit about his books here.) Anything he writes is commendable, serious, important. As you can see from the sub-title, these conversational chapters—each rounded out with an action plan or case study—explore in simple, but important ways, the ways to avoid the “soul-sapping struggles of the work world. They look at the “nine deadly sins” of the workplace, the nine-fold fruit of the Spirit that can meet our workplace needs, and nine positive outcomes of integrating spirituality and work. Friends, this is good news, indeed. Serious, uplifting, honest, and very, very insightful. Few books in this field are as deeply spiritual, theologically informed, and yet nicely practical. 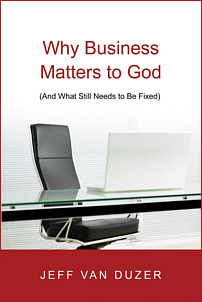 This serious book explores the nature and meaning of doing business and find it calls for much more than most think. It promises to integrate Biblical studies, economics, and business. This is helpful because (as the previous books presuppose and suggest) being a Christian in business–as it does for any field, really–demands more than personal virtue or good ethics. There are what might be called philosophical considerations and structural, systemic matters. This emerged from years of the author’s struggles and thoughtfulness, it is a bit provocative (whether one tends to be a bit conservative or liberal–yea!) and very, very helpful. Highly recommended. 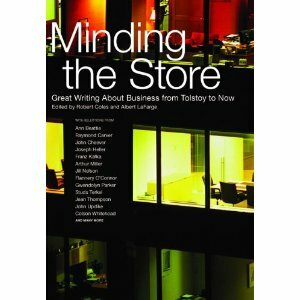 Minding the Store: Great Writing About Business from Tolstoy to Now edited by Robert Coles & Albert LaFarge (The New Press) $25.95 Okay, this isn’t going to be found in just any ‘ol bargain bin, and I can assure you, it is a truly extraordinary collection. We love having some of these sorts of top-shelf texts and trust that some of our customers will consider it as a gift, or as a choice for a workplace study, even. The always subtle, wise, and serious Robert Coles here gives us the best of what literature can do. Here you will find some giants of late 20th century fiction such as Raymond Carver, John Cheever, Joseph Heller, John Updike, Walker Percy. When you think about it, you’d come up with a few of these other authors, too—Arthur Miller, Flannery O’Connor, Studs Terkel, Sinclair Lewis. There are some delightful pieces (O. Henry, James Agee, Leo Tolstoy) and a true surprise or two. (Can you say Kafka in your corporation?) This came out of a class Coles taught at Harvard Business School. Wise, stimulating, enjoyable. I suppose I don’t have to tell our astute readers, but, you know, this isn’t particularly Christian and would be a fine way to introduce good conversations in nearly any morally-serious setting. In some very cool sections, he combines astute historical studies–how does he know all this stuff?–and brings lessons learned into today’s context. And he helps us do under-the-radar theology by re-thinking what we mean when we say things like this ought not to be, or that’s just the way it is, or even when we dream of what could be. Mike is smart, savvy, a born-storyteller, fun, with a remarkable drive to implement new ideas. He reads veraciously, and seems to always be in conversation with books and ideas and authors (like, say, James Davison Hunter and his influential Oxford book To Change the World or Matthew Crawford, academic-turned-mechanic of Shop Class as Soul Craft, or thinker/consultant George Lakoff, not to mention historical biographies and up-to-the-season sports talk.) The excellent forward shows the power of his ideas and work; it is written by the CEO of classy gift company, DEMDACO, David Kiersznowski. 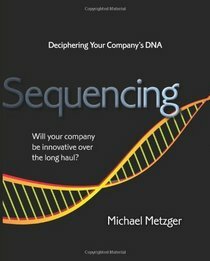 This is a rare book, a great book, and one we are thrilled to recommend for anybody that wants to help decipher the deepest meaning of their organization’s DNA and be an agent of healthy flourishing and redemptive-leaning change.